Shrimp scampi. What's not to love? Butter, garlic, seafood ... yum! 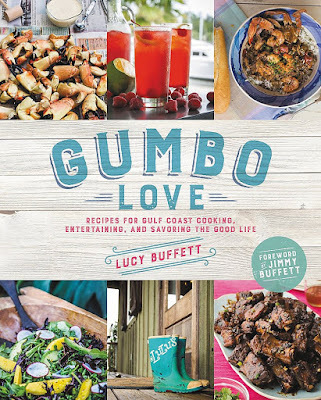 For some reason, I don't make it very often, but when I saw a recipe in Gumbo Love by Lucy Buffet, I had to give it a try. Of course, I switched up a few things. Fresh shrimp really doesn't exist here, but I buy it frozen when it looks good. I happened to have a bag of cooked, peeled shrimp in the freezer, so I used that. The recipe actually called for raw shrimp, but I knew I could make it work. Gumbo Love is another one of the books that's getting passed around in the group I belong to. I also made a pound cake from the book that I thought was almost perfect. The texture was good - which is really amazing up here at high altitude - but I thought it was just slightly too sweet for my taste. But that's okay. I'll probably made it again and adjust the sugar level down and see if the texture remains the same. I also made a black bean and corn salad from the book. Most of the time, I just toss things together for a salad like that, but this time I (mostly) followed the recipe. The scampi, though ... I really need to keep this recipe. Thus, a blog post. In a large heavy skillet, heat the oil over medium-high heat. While the oil is heating, season the shrimp with just a little of the salt and pepper. Add the shrimp to the skillet and saute for 3 minutes, then remove the shrimp and set aside. (Since my shrimp were pre-cooked, I skipped all of this. Add the butter to the skillet and allow it to melt, but be careful that it doesn't burn. Add the shallot and garlic (here's where I added salt and pepper) and saute until they start to caramelize. Add the wine to deglaze the pan, scraping up any gooey bits stuck to the pan and stirring them into the wine. Add the lemon juice, red pepper flakes, and the remaining salt and pepper. Cook for a minute or two, or until the liquid has reduced by a third. Return the shrimp to the pan (here's where mine entered for the first time) and cook until the shrimp is cooked through (or warmed through, if they're precooked). Turn off the heat, add 1 tablespoon of the parsley, and stir well. Serve the shrimp over the rice and garnish with the remaining parsley. If you've read this blog at all, you probably know that I belong to a group where we mail cookbooks around in a round-robin style. When I got Half Baked Harvest, I kind of skipped past all the harvesting and landed on these cookies. These are insane. 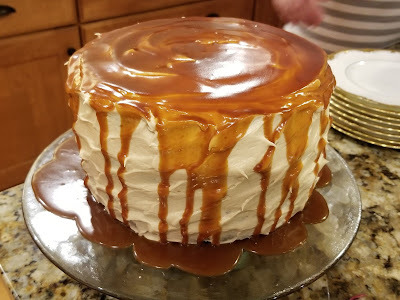 They're best when slightly warm so the caramel is a little soft, but if you make them and let them cool - because eating a whole batch would be kind of crazy - you can still have that soft. center. Just pop them in the microwave for a few seconds before serving to get that soft caramel center. 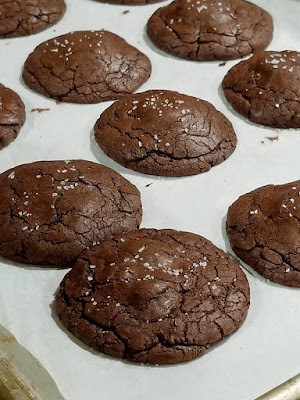 I made a few other recipes from the book, but this is the one I decided to share on the blog. I don't like to share more than one recipe from a book, although most publishers are fine with up to three recipes without special permission. This one, though, was worth saving, publishing, and making again. Preheat the oven to 325 degrees and line a baking sheet with parchment paper. In a small saucepan, combine the butter, bittersweet chocolate, and chocolate chips. Cook over low heat, stirring often, until fully melted and combined. The chocolate will be thick. Remove the pan from the heat and let the chocolate cool slightly. Note: if you're comfortable melting chocolate in your microwave, you can do that here. Melt in short bursts and stir in between. In a small bowl, using a handheld mixer, beat the eggs and sugar together on high until light and fluffy, which should take 2-3 minutes. Add the vanilla and the melted chocolate, and beat for 1 or 2 minutes more, until well combined. Scrape down the sides of the bowl as needed. Note: I did this in my stand mixer, using the paddle. Add the flour, cocoa powder, baking soda, and kosher salt. Beat until fully combined and smooth, about 3 minutes. The batter should be thick but pourable - don't worry, it will turn into cookie dough. Cover the bowl and refrigerate for at least one hour, or overnight. Note: I left mine in the fridge longer, with no ill effect. You just don't want to forget it in there for too long. Scoop out a scant 2 tablespoons of dough and place them 2 inches apart on the baking sheet. Flatten the dough into small disks, about 2 inches in diameter - you can grease your hands with a little oil if this gets messy. Place a caramel in the center. Scoop out a rounded teaspoon of dough and flatten it into a disk. Place this disk on top of the caramel, pinching the layers of dough together. Note: I followed the instructions for forming the cookies for the first batch I made, then changed gears and did it in a way that made more sense to me. So feel free to improvise. 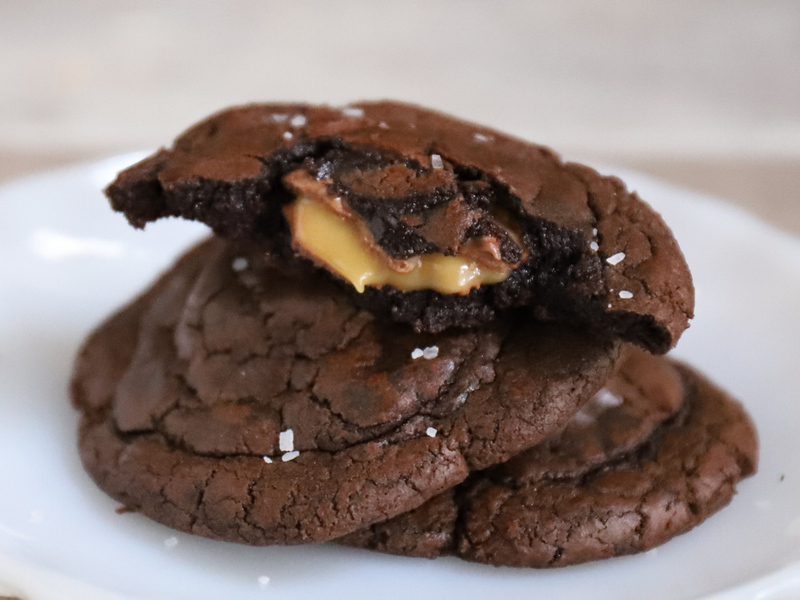 You want the caramel neatly enclosed by the dough, with the top a little thinner, and you want the cookie somewhat flat. It will spread a little during cooking, but its nice to give it a little help. Bake for 10-12 minutes, just until set on the edges. Remove from the oven and sprinkle each cookie with a little flaky salt. Note: in the second batch, I added salt before baking - it seemed easier, and the salt stuck a little better. Let cool at least 5 minutes on the baking sheet before serving, or place them on a rack to cool completely and rewarm later. This cake is also from Half Baked Harvest. It's a three-layer chocolate cake filled with chocolate fudge that is drizzled with caramel sauce. It's frosted with caramel frosting, and then drizzled with more caramel. This is NOT an everyday cake that you'd make for a family dinner, but if you want a showstopper for a party or event, this is it. A bottle of dressing. So un-photogenic. Sometimes I am such a dork. I saw this recipe for ranch DIP and made it and wondered why it was so thick because in my head I was making ranch DRESSING. 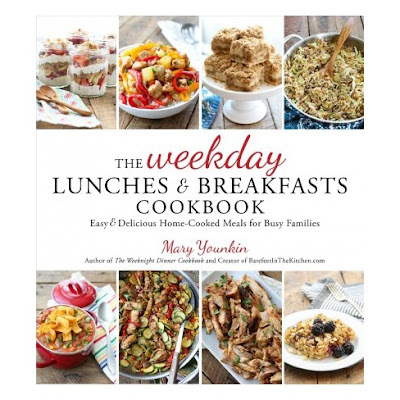 A while back, I got and reviewed The Weeknight Dinner Cookbook by Mary Younkin and I loved it. The recipes were creative, but easy. I literally could make a really good dinner in a short time. Yeah, I work from home and in theory I could start cooking at noon if I wanted to, but when I get wrapped up in work, I often don't think about dinner until hungry happens. 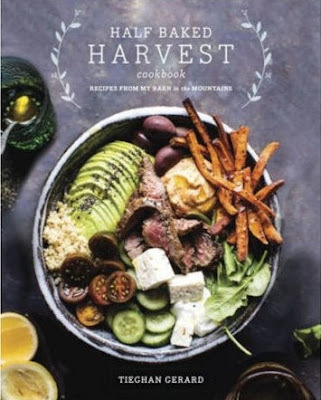 So when I realized that Mary had another cookbook coming (The Weekday Lunches and Breakfasts Cookbook ), I pre-ordered it on Amazon because I couldn't wait to get my grubby paws on it. And then I got another copy from the publisher to review. Oh well. I have plans for that second copy, no problem. My usual lunches are either leftovers from a previous dinner, or I'll make something simple, like a sandwich. So the idea of a cookbook devoted to lunches wasn't entirely in my wheelhouse. Except that pretty much anything that's deemed a lunch meal (or even a breakfast) is perfectly acceptable for me any time of the day. Tortilla Eggs with a side of pickled spicy vegetables. I dived into the cookbook and came up with Tortilla Eggs, which is basically an egg cooked on a tortilla with some cheese and ... well, yum. I made it a couple times because it was so freaking simple and so satisfying. But then I saw the ranch recipe. I love making home made salad dressings of all kinds, and I'm always looking for new variations. Can I make a little confession? I never really had ranch dressing until I was an adult. When I was growing up, we made all kinds of vinaigrettes as well as Thousand Island. At restaurants, I'd order creamy garlic. But ranch was never on the radar. But once I tried it, I admitted it was pretty good. And home made versions are just so much better. So, I saw ranch, thought it was a dressing, and combined the ingredients. And there it was, too thick. But I fixed that with the addition of some buttermilk that I had on hand, and it suddenly became a very tasty salad dressing. The recipe notes that you should add the dill to taste, and I think that's a good caution. When first made, the dill wasn't very bold, but after the dressing had time to rest, the dill flavor came forward a bit more. It wasn't bad at all, and of course it depends on how you're serving it. And I guess it depends on how fresh your dried dill is. So anyway, you might want to start with a bit less and you can always add a bit more. Whisk all of the ingredients together. Cover and refrigerate until ready to serve. The flavors will intensify after the dried herbs hydrate, so it's a good idea to make this in advance. Note: to turn this into a dressing like I did, just add buttermilk or even plain milk until it's the consistency you like. I got a copy of this book from the publisher at no cost, but also bought my own.